Kauai artist Patrick Ching has developed an unusually progressive art show concept with great success. Many people actually get to paint on Ching’s originals and others watch on live streaming video as he works on them. The online auction format raises money for its beneficiary, the Kilauea Point Natural History Association. 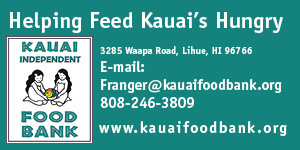 The Kai show has been one of the largest donators to KPNHA since its first show in 2013 at Princeville Center. There will also be Art Classes and community events going on during the month long show.